Upgrade and add the option to see Miami from the water on a 90-minute Biscayne Bay Boat Tour, or package your upgrade with a 90-minute Night Tour to see Miami lit up after hours. During your boat tour, you'll see the city skyline, Fisher Island, Miami Beach and the port of Miami's cruise ship and cargo districts. You'll also see homes of the rich and famous including Gloria Estefan, Shaquille O'Neal, Diddy, Rosie O and many more. All vessels have plenty of seating both inside and out. Lower salons are enclosed, air-conditioned and have full facilities. Upper decks are open air with partial awnings. Soft drinks, beer, wine, cocktails and snacks are available for purchase on board. Schedule your cruise at any time at stop 1, the Bayfront Park/Bayside Marketplace, just a short stroll from the marina. On your Night Tour, explore the best of Miami when the sun has set. With live narration on board, you'll cruise through Downtown Miami and South Beach while enjoying panoramic nighttime views of the city. This 90-minute tour is the best way to end a day full of Miami sightseeing. 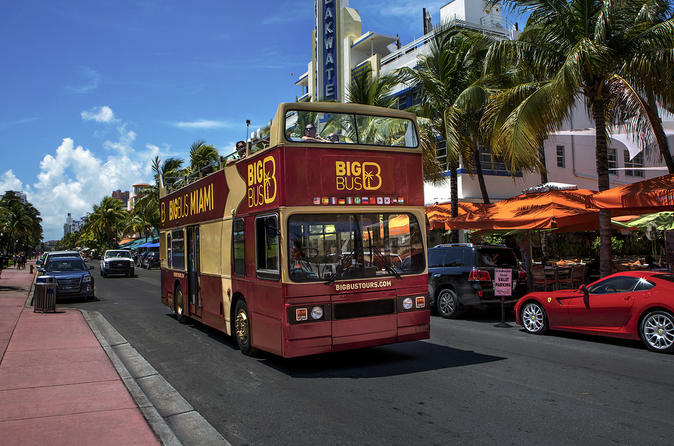 The main hubs for hop-on hop-off touring in Miami are the Central Station in Downtown Miami in Bayfront Park, South Beach and Coconut Grove. Tours depart every 30 minutes on the Beach Loop and the City Loop. Book with us for June 1, 2016 - August 31, 2016 travel dates and save 10% compared to another travel site!